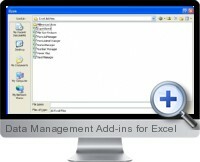 The Data Management Add-ins for Excel are a suite of add-ins designed to save time in building Excel models and managing data in Excel. The add-ins provide useful tools that go beyond the standard features of Excel and address commonly demanded tasks. Create a contents menu with links to worksheets for faster working. Bring reminder messages into Excel. Display formulas list with links to each formula to make editing and locating formula errors much faster. Provides more cell range options than provided by standard functionality. Convert imported numbers into true Excel formats. Hide zeros, text, numbers, negatives, positives with one click. Manage duplicates, find and delete duplicates in lists. Convert vertical data into horizontal rows with one click. Copy data ranges to a different part of a workbook keeping the original cell references. Reduce files to save disk space.